You might be wondering just “what is a giclee?”, and that’s a very good question. Luckily there’s a easy answer that most printers won’t tell you: a giclee is quite simply an inkjet print that has been made using archival pigment-based aqueous inks onto an archival medium – like an acid-free fine art paper. It’s really nothing more than that! Where it often gets confusing is when big chain franchises and office-supply stores or copy shops start to market what they’re calling “giclee” prints, but in truth they’re just…big prints. What sets apart a giclee print from other large format prints is that they are archival, and the quality is of a standard that quite often the print is indistinguishable from the original. The truth that most printers won’t tell you is that the equipment and inks and papers are all the same – our own clients have bought some of the smaller printers themselves, and we’ve helped them learn how to use them in their own studios. There is no magic formula or process that makes the printer itself “special” or a “giclee printer”. Any inkjet printer that uses pigmented archival inks can technically print an archival fine art reproduction. Whether the color and detail of the original artwork, or the vision held by the photographer at the time of capture, is represented through the whole process determines whether the final product is truly a giclee fine art reproduction that is of “museum quality”. 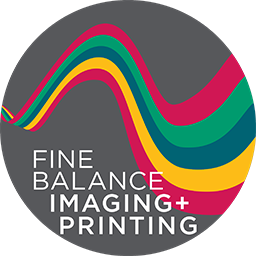 Fine Balance Imaging Studios grew from a love of art and artists out of a fine art gallery where its founders learned the difference between quick prints, big prints, and truly museum or gallery quality fine art prints. We have always strived to produce the finest possible quality prints, all the while informing the artists and photographers of the process through demonstration and the care that goes with personal service. There has been a shift in the art print world over the last decade to where the word “Giclée” has been appropriated into what we call a “fancy marketing term”. In its original inception, giclée prints were supposed to be the pinnacle of continuous-tone fine art reproductions, the absolute best possible fine art prints that could be made. For years they were marketed by ateliers and artists alike as “museum quality”, mostly because many museums had adopted the same process as the fine art reproduction studios. Unfortunately, over the years, the mastery of the giclée printing process has been cast aside and the term “giclée” has been incorrectly appropriated by copy shops and business centers that don’t actually have the proper technology to create true “museum quality prints”. “Giclée” has become a synonym for “art print”, when the truth is that a fine art reproduction or fine art print is only truly a giclée if it is printed using a sufficiently high-resolution printer with pigmented archival inks – and on to an archival fine art paper. If dye-based inks are used – often the case in sign shops and copy centers, especially on large-format printers made displays and banners – then inevitably they will fade much faster than a true “giclée” print. The substrate is the other half of the equation for a high-quality fine art print. Most fine art prints are created on watercolor papers, usually cotton rag or alpha-cellulose (tree fiber). As long as the paper is archival, it is considered a giclée print. Many newer papers offered with traditional style photo surfaces are also considered archival. We’ve even transferred archival ink images onto metal, glass and wood panels – and given the relatively stable nature of those surfaces, even those prints could be considered giclée prints! Also, everyone pronounces “giclée” slightly differently, but the origin of the word is French, and simply means “to squirt or spray”, hence its appropriation as a marketing term for inkjet prints. The proper choices for pronunciation of “giclée” are either “zhee-clay” or “gee-clay”. But we’ve heard everything else as well, and recommend folks just start calling them “fine art prints” instead to save the trouble.